"Gentlemen Start Your Engines!" Stock Car racing is hot! This unique true stained glass light features hand constructed glass, brass channel and is hand soldered. Seams are hand wrapped in copper foil. A must have for all racing fans! You will not believe how beautiful this fixture looks when lit! Your guests will marvel at its beauty. You'll take the checkered flag every time this baby lights up! 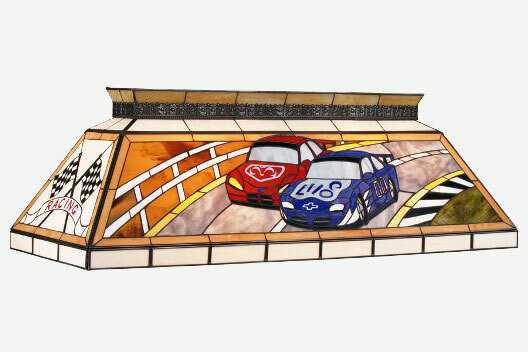 See our matching Stock Car Poker table light.